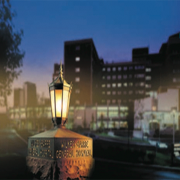 Wilkes-Barre General Hospital is Northeastern Pennsylvania’s largest community hospital, with 392 beds and a medical staff of more than 400 physicians representing nearly 50 medical and surgical specialties. Recognized for its excellence in heart and vascular care, inpatient and outpatient cancer care and wide ranging surgical specialties, including orthopaedic surgery, neurosurgery and minimally invasive surgical procedures, Wilkes-Barre General Hospital is also home to the region's busiest emergency department, which treats more than 55,000 patients a year. Conveniently situated in the tri-state area, Wilkes-Barre offers easy access to highways and airports. Wilkes-Barre is only hours away from major cities like New York and Philadelphia. If you prefer nature to the bustle of an urban setting, Wilkes-Barre is a short drive from the beautiful Pocono Mountains and boasts a number of natural park lands. Wilkes-Barre offers a wide variety of dining and shopping options for residents and visitors. Both locally-owned and nationally recognized restaurants, such as Rodano's Pizza, are within walking distance from Public Square and the movie theater.